Other Ingredients: dibasic calcium phosphate, sorbitol, colloidal silicon dioxide, modified cellulose gum, stearic acid and magnesium stearate. Contains wheat/gluten. Cat’s Claw: Don’t go by the name — it’s a botanical remedy for some of our worst ailments. 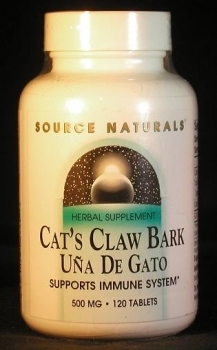 Cat’s Claw is made from the bark of a woody vine from the Amazon rainforest. It has been used by Peruvian tribes for at least 2000 years to treat a wide variety of ailments including many inflammatory conditions, infections, ulcers, and certain cancers. increase longevity of immune cells. Recent scientific studies of Cat’s Claw have confirmed its usefulness in all of these areas. It is now employed as an immune stimulator, and as a treatment for inflammatory conditions such as arthritis and ulcers. In clinical trials it has shown benefit in reducing symptoms of osteo- and rheumatoic arthritis. Other studies suggest an ability to suppress breast cancer proliferation, protect DNA from chemical-induced damage, and to increase longevity of immune cells. Cat’s Claw also contains alkaloids with properties that suggest its use for cardiovascular conditions, for prevention of blood clots and strokes, for slowing the heart rate and for lowering blood cholesterol.